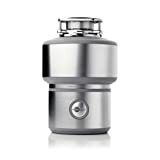 Shop here for the perfect garbage disposal to use in your kitchen! A quality garbage disposal conveniently grinds up food waste, often creating tiny pieces that go right down the drain. Consequently, it avoids uneaten food scraps sitting in the trash, attracting pests and generally stinking up your home. Instead, they go down the kitchen sink, leaving no trace. The first choice to make when looking for a garbage disposal is between a batch-feed model and a continuous-feed one. The former is safer around children and the user, is often powered by a power cord or simple outlet, and allows you to load it up with food scraps before using the magnetized stopper to activate it. Meanwhile, the latter is ideal for families that build up a lot of wasted food, and allows you to drop food waste in while it's running. However, for curious kids with sticky fingers, this type of garbage disposal can present safety risks. In those instances, you may want to power your drain with a garbage disposal that uses a wall-mounted power switch. When you're shopping for the right type of garbage disposal, keep in mind that experts often warn against grinding up food waste that is particularly fibrous, such as banana peels, celery and corn husks. In addition, steer clear of putting rice or pasta down the disposal, these foods tend to block pipes by expanding. Furthermore, non-food items like grease shouldn't be used. Let's take a look at the best garbage disposals for home. While you're shopping for a garbage disposal, it's wise to consider the kind of power you'll need. In addition, the amount of grind stages can add to the overall grinding capability. Finally, the warranty can give you an idea of how long you can expect support from the manufacturer. Talk about #Value! If you're hunting for a best-seller, the InSinkErator Evolution is an option that leaves thousands of owners very happy. 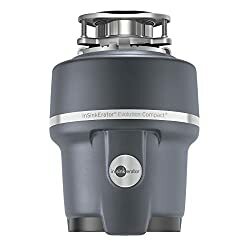 This garbage disposal includes a grind chamber capable of holding 34.5 ounces of food waste and provides ¾-horsepower to keep you running as a result. That's more than enough space and power to meed the needs of an especially hungry, large family. Furthermore, this unit uses grind components that are made of stainless steel, as well as a continuous-feed design that is able to handle food in a constant stream. Experts and reviewers alike claim that the InSinkErator is the perfect size for a lot of food waste as well as cutting through vegetable scraps that may be tougher. Overall, it's given good marks for the grind fineness as well as speed, though it may get some lower marks when it comes to noise. In addition, many owners love the anti-vibration qualities as well as sound-insulating technology used in the InSinkErator. Both the tailpipe and sink mount are anti-vibration and the SoundSeal results in a quieter experience. On top of that, many owners find that it's an easy garbage disposal to install without the need of a professional. This model is a great one when it comes to handling a lot. It's a disposal that contains power in plenty, thanks to the InSinkErator's design. Keep in mind if you try out this model that there can be some cases where it lacks durability, resulting in the sink beginning to drain slowly due to the rubber baffle or other issues with leaks. While many find this to be a powerful, quiet machine, others may find that it jams too easily or that it may arrive in nonworking condition. Runs more quietly than other options. Keeps vibration to a minimum. Can arrive in nonworking condition. There can be instances when it can jam easily. 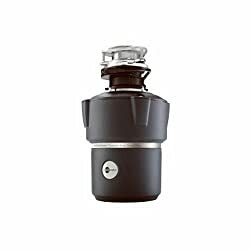 For those who are seeking a high-quality, affordable garbage disposal, this is a perfect choice. While the InSinkErator Pro might be on the pricey side, it's a great option for those who need to feed a whole lot of mouths. Furthermore, it's a perfect choice when you have a constant, larger stream of wasted food and need something that is able to stand up to it. When compared to garbage disposals that are smaller and generate less power, this option is definitely worth the investment. Many reviewers have found that they love this garbage disposal. 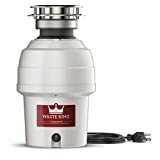 Offering a motor that is capable of 1,725RPM and 1.1-horsepower, the InSinkErator is able to provide a grind chamber that is able to hold up to 40 ounces and is made from stainless steel. In addition, it's able to handle food waste in larger amounts pretty easily at a single time. This garbage disposal also gets very good reviews with the ability to handle rough vegetable scraps and noise and top marks when it comes to the ability to finely grind foods. On top of that, the Multigrind technology allows the InSinkErator to provide three stages of grinding rather than the two provided by other disposals. Consequently, it does a great job of taking larger chunks and breaking them down than cheaper options might be able to. Furthermore, this option provides some very useful features such as a jam sensor, auto-reverse function as well as a Sink Baffle with a Quiet Collar design. Overall, experts find that the InSinkErator makes it easy to clear out stuck food and cuts down excess noise as well as annoying vibrations thanks to the SoundSeal technology. As a result, owners find that the disposal offers a lot of power while also running very quietly. It's also an option that installs easily, though it is worthwhile to note that you'll need to purchase a power cord separately. That said, the 7 year warranty ensures that you're protected if something should go wrong. As one of the best ones out there, this option ensures you'll get service in-home as needed. Some customers can find that this disposal can arrive damaged or break down too quickly for their preferences. Sufficient for most food items. Motor can break down quickly. For those who are looking for something heavy-duty without a giant price tag, this is an ideal solution. The Waste King Legend is ideal for those who want an easy installation process in combination with a sturdy build. Consequently, it's a very popular option for many people. Like the InSinkErator, this garbage disposal is able to provide grinders that are stainless steel as well as ¾-horsepower capabilities. Furthermore, this unit is a continuous-feed option, and provides the features that allow it to withstand the test of time. The Waste King is also a front-mounted option, and it includes a splash guard that is easily removable to meet your needs. In addition, the reset button makes it also a great model for handling a lot of food waste. The Waste King is also an option that will keep running through it all, making it convenient for users with larger families. During operation, it's also able to reduce noise thanks to the sound insulation, which keeps the noise limited even while you keep adding food. As a result, reviewers find this garbage disposal to be pretty typical when it comes to sound, though some may complain about a loud click that can take place when the disposal is turned on. Many users find that the Waste King makes them quite happy, from the ability to handle a lot of food fairly waste easily without worry of jamming to the powerful blades in the motor that handle it all. Due to the EZ mount, you'll get easy installation of the system as well as all the hardware necessary for getting the job done. Overall, it's an option that will blow you away from the first use. If that's not enough to impress you, then you'll be happy to know the manufacturers have you backed with a 10-year warranty, which allows for in-home repairs as needed. In addition, there's a lifetime warranty that ensures the disposal is protected against any potential corrosion. With all of that, you'll be able to trust that your mechanical device is fully covered for in-home use. Though many users find this to be a perfect for their household, some can find that it doesn't work well for the kind of sink they own. May not install well in porcelain sinks. Installing can be more difficult than some other options. This is a great choice for those who are looking something highly effective at a lower price. The InSinkErator Evolution is a perfect garbage disposal for those who might have little fingers wandering curiously around the house. The batch-feed design in combination with the stopper allows for more peace of mind when it comes to the little ones in your home. Overall, this batch feed model has a lot to offer, making it one of the very best disposal models on the market today. In addition, the InSinkErator provides a grind chamber with 40 ounces of stainless steel space as well as a motor capable of 3/4-horsepower. Due to the design, it's made so that the magnetic stopper has to be inserted in order for the disposal to turn on. You will also need a light switch for this purpose, but it also ensures safety as well as overall very good effectiveness. Furthermore, this is an option many experts approve of, earning top marks when it comes to tests for noise, speed, ability to get through vegetable scraps, and fineness it's able to create. The InSinkErator is able to shred just about anything thanks to the two-stage setup for grinding. On top of that, it does the job with less noise thanks to the SoundSeal features used in the garbage disposal. When compared to other models out there, the InSinkErator is able to run fast and uses the technology that allows it to be very quiet. While some owners may complain that the stopper may be a bit flimsy, most agree that it's an option that offers easy installation the the ability to kick on with the flip of a switch. Due to the sink mount, which is designed with Quick Lock preferences, this model is easily connected, though reviewers can find that they have to buy a power cord. On top of that, this model includes a seven year warranty, ensuring that the disposal is backed for in-home services for a long time. While this does tend to be a great garbage disposal, it is one of the more expensive options out there. Can be difficult to use. For those who prefer the safety that a batch-feed garbage disposal can offer, this is an ideal solution. If you're looking for a quality garbage disposal but don't need a great deal of power, then the Waste King L-111 may be just what you need. This is a great option for anyone with a smaller budget, or a small household that doesn't waste a lot of food. The price and effectiveness is recommended and appreciated by hundreds of owners, making it an ideal option for potential buyers in similar situations. In addition, the Waste King has a lot of great features to offer, including grinders that are stainless steel, a continuous-feed design and a motor capable of 1,900RPM, offering 1/3-horsepower. Consequently, the model proves to be a great fit for apartments and small kitchens where it isn't a nightly affair to provide large dinners. The unit also offers insulation for perfect sound-reducing capabilities as well as a splash guard that is easily removable. Owners and reviewers alike find that the grinding chamber is also highly durable and corrosion-proof, allowing it to last longer than other disposals out there. Furthermore, the reset button on this model is front-mounted, making it easy to repair when food waste may have jammed it up. 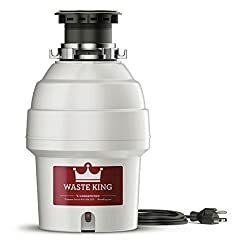 Many also find that they don't even need a pro to install the Waste King, as it's easy to handle themselves. On top of that, the less-powerful design also offers the upside of a quieter motor, which is pleasing compared to larger, more powerful options. Some customers have found that there can be a bit of stiffness to the splash guard, which can result in them having to push things down the Waste King more actively. However, aside from that it's a disposal with plenty of power, and is backed by a 2-year warranty. That means if you should experience any problems with the model, it will be taken care of in-home. Some users can have problems installing this disposal, with it not working or having issues with clogging easily. Instructions are clear and simple. Some customers can experience problems with it not working. In some cases, it can clog easily. The L-111 is a fantastic choice for those who want a quality garbage disposal on a tighter budget. For those who are searching for a top-of-the-line option, the KitchenAid Superba is highly efficient, ultra-quiet and worth a look! Whether you're looking for a replacement of finishing a remodel on a higher-end kitchen, it's a great garbage disposal overall. Reviewers and owners alike find this to be the option with the best performance possible. Due to a grind chamber that can handle up to 40 ounces of food waste and a 1,725RPM motor with 3/4-horsepower, the KitchenAid Superba is certainly an option that can get through a lot of big family dinner. In addition, you won't have to worry about the disposal being burnt-out by constant use, as the motor is made to handle continuous-feed. According to experts, this is a garbage disposal option that get top marks for grind fineness and some very good marks for handling vegetable scraps, noise and speed. Consequently, the KitchenAid Superba features the ability to grind in two stages, which keeps the device and user protected from any overloads. That said, if there is a problem you can rely on the manual reset button, as well as the SoundSeal technology to allow you to resolve the issue quickly and without too much noise. As a result of that addition, the KitchenAid is able to be 40 percent more quiet than other standard models. 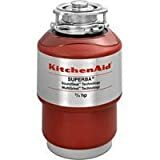 Overall, the KitchenAid Superba is truly a disposal that you can trust, providing a step up from standard options that may be loud enough to disturb conversations nearby. Consequently, it's a great choice for owners with floor plans that are wide-open or kitchens that tend to be busier. It often sounds so quiet, that reviewers sometimes wonder if it's actually working at all. If that's not enough to persuade you, then the 5 year warranty the device is backed by should! While the vast majority of users find this to be an ideal garbage disposal, some can find that they have trouble getting it to churn through all foods, resulting in them having to take the food out and throw it away. Can take up a lot of space. May not be able to dispose of all foods. For those who are keen on a high-end model, the Superba is a perfect choice. The Waste King 9940 is a perfect choice for those looking for more insulated sound, less jamming and a high-speed, powerful motor. It's capable of 2,700RPM and provides 3/4-horsepower using a motor made with a permanent magnet to get the job done. On top of that, it also uses a simple 3-bolt mount to make installation easy. Getting it installed in your kitchen sink will be easy and quick, without the need for a pro. Furthermore, the Waste King 9940 is suitable for hooking up to your dishwasher, thanks to the help of a power cord that has been pre-installed, minimizing the required electrical work. This is also an option that is lightweight and compact, making it an easy garbage disposer to install and use. Due to the continuous-feed design and durability of grind components that are made from stainless steel, you'll be able to rely on this disposal for quite some time. 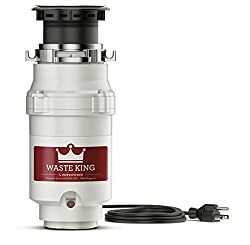 In addition, the Waste King 9940 helps to quickly grind away all of your food waste using the wall switch to activate the disposal. On top of the ability to run continuously, it also comes with an 8-year warranty, which is in-home and limited. Some customers may find it isn't as powerful as they had hoped. Not powerful enough for all users. Can be too loud in some cases. This is a great option for those who want something very effective at a very fair price.